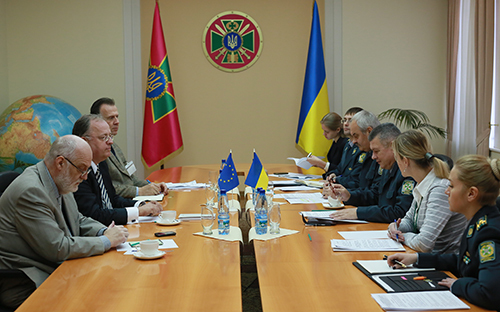 On 6 November 2014 General Victor Nazarenko, the new Head of the Ukraininan Borderguards, convened with representatives of the Support Group to Ukraine, the EU delegation and EUAM, represented through its strategic Border Policing Advisor Lasse Christensen. The main prurpose of the meeting was to provide a mutual briefing on the assessment of the current situation, in particular in relation to the reforms and potential challenges. The Support Group representative Frank Paul addressed his organisation’s request for an identification of particular technological needs that could be met, whereas EUAM concentrates its advisory effort on the Borderguards reform and its implementation. Lasse Christensen stated that a daily cooperation between Borderguards and the European Union Advisory Mission has already been established.